I have this nightmare that one day I'll develop an intolerance to caffeine and *gasp* chocolate. In this dream I walk around licking the rim of an empty cup, depressed and hollow-eyed, not from lack of sleep but from thwarted desires. What would I do without my 3 favorite things in the world? Coffee, tea and chocolate make life worth living! Because of this nightmare, this product - D+Caf - caught my eye. It tests your beverage for caffeine to insure that - if you MUST drink decaf - your cup really does contain unleaded. I had to try it. In case you don't know, decaffeinated beverages are not totally caffeine free. Under federal regulations in the U.S., caffeine levels have to be 2.5 percent of the product or lower in order for a product to be labeled "decaffeinated." (Check out this article if you're interested in how decaf becomes decaf. 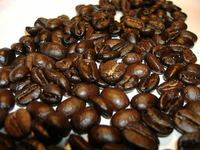 Or this great article if you're a home roaster who needs decaf beans.) Now, according to most sources, an 8 oz cup of regular drip coffee contains between 104-192 mg caffeine. Tea can run between 20-90 mg caffeine per 8 oz cup. What is being sold as decaf varies, too, but this study showed that your average restaurant unleaded can contain caffeine ranging from 8.6 milligrams to 13.9 milligrams, and Starbucks decaf espresso contained 3 mg to 15.8 mg of caffeine per shot. Swenyway, this little D+Caf strip-doo-dad tests for caffeine levels of less than 20mg per 6 oz cup. I did the test using Millstone Hazelnut Cream, regular and decaffeinated, using the same amount of coffee / water and same brewing method. The picture here shows the results of the test strips. 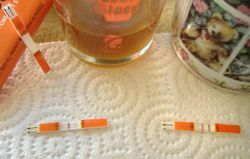 Yes, the one on the left is the decaf, the test strips worked. But I must confess I was a bit disappointed. I was hoping for something more precise. Something ... well ok, something less than a tricorder readout, but closer to a pool chlorine test strip maybe, that would show me a range. Colored stripes ranging from green (really really LOW caffeine level) to RED for "danger zone". These little strips are more like a pregnancy test. It's either yes or no. Heh. So, if the little line on the left is all you see, then you're safely in the unleaded zone. If you see two lines, or one dark line on the right, you've got too much go-juice in your cup. That is valuable info if you have a caffeine sensitivity and really REALLY need to know what you're drinking. I still would like to see more precise information, but I might have to keep a supply of these on hand, just in case my nightmare ever does come true. Related: Can't Get Enough Caffeine? My brother called me a coffee snob the other day. "Coffee snob?" says I. "Am not!" After we finished this highly erudite and mature conversation, I stopped to think about it. Am I a coffee snob? I don't use all the fancy words like "cupping" and "floral and bright" to describe my tasting experience. Coffee high mucky mucks can get into the special language trap and that puts people off. I don't do that. And I don't look down my nose at other people for what they drink. I don't care what they drink or how they fix it. I am very fussy about what *I* drink - ever since I started roasting my own coffee I can't drink much else - but I don't shove it down other people's throats. Heh. So to speak. Except occasionally I play coffee bar for visitors, just so they can see what coffee really ought to taste like. But I'm not a "purist". I do sometimes drink black espresso shots with no frills. But the fact that I like a latte or cappuccino might make me "less than" in a true coffee snob's eyes. So by way of proof that I'm not a snob, I have to cop to my latest addiction - sweetened froth. omg this is good. I just put a little sugar in the milk before I froth it. 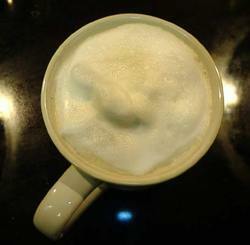 The idea here is not to sweeten the coffee, although that happens too, but to sweeten the foam. I wonder if my brother will accept this argument. I have a problem with cups. Coffee cups in particular. 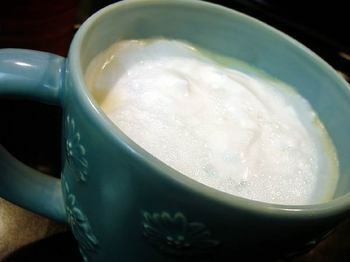 For my morning latte, I like a bigfat (think mini-soup bowl), thin rimmed cup, both microwave and dishwasher safe, with a comfortable handle for my littlish hands. Not an easy combination to find. I had one, which I blogged about previously, that I loved loved LOVED. 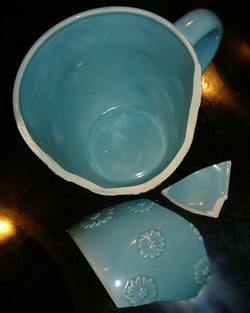 It was big enough, had a lovely thin rim, pretty blue with little flowers on the outside. The perfect cup. Look what happened to it. Is this not the saddest thing you've ever seen? I didn't do this all by myself, I had help from a four-legged friend who got a little too rambunctious and paid for it by wearing spilled coffee on his head. I went back to the store whence it came and tried to find another. Unfortunately, there were none. Line discontinued. I tried to glue it back together, but ... no go. So I got online and searched for the maker - it's one of the dine series made by HD Designs. I found some HD Design stuff, but no dishware like this. Majorly bummed, I bought this, because it was the only BIGCup I could find. Whimsical, yes. Colorful, yes. Big, sure. But it's got an equally bigfat rim, and it's heavy. Clunky even. Not only that but - although it claims to be microwaveable - it heats up way too much in the nuker. Don't know how to get around that problem. Anyway, lo and behold, the other day I found a new cup that is almost big enough - just a skoche bigger and it would be perfect - and has a nice thin rim AND is safe in the nuker. Not blue or flowery, but kinda classy in a country sort of vein. Yep, same company. HD Designs. I wish I could find a website for them, I'd email somebody and say - You're my kinda peeps! I've missed HOW MANY Chocolate Fridays? Well I'm jumping back into the blogosphere with something really easy that combines two of my favorite things: chocolate and coffee. I've always wanted to try chocolate covered coffee beans. I wasn't sure I would like them, to be perfectly honest. I'm really addicted to my liquid coffee, but chawing on a crunchy bean... I wasn't too sure about. I'm here to tell ya, they're great. This is the perfect antidote for a long drive, or a hiking trip, when coffee of the liquid variety is hard to come by. Pop a few of these for some tasty instant rocket fuel. I'm serious, those with heart conditions beware. I popped half a dozen and a few minutes later, the top of my head came off. And the recipe is so easy! 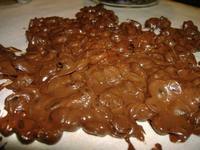 I tried using flavorings in the chocolate, and different types of coffee beans, some more exotic than others. And the conclusion I've come to is they're best with a good hearty basic espresso bean, and just plain semi sweet chocolate. Exotic coffee beans detract from the chocolate. 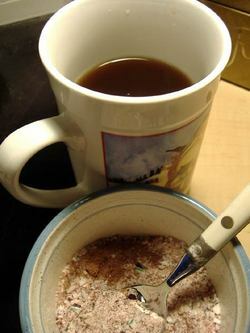 And added flavorings seem to detract from the coffee. Basic and not too sweet is best, IMHO. 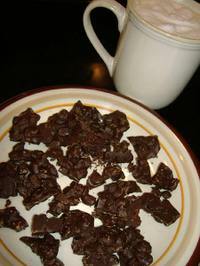 In a bowl, melt chocolate chips in microwave for 1-2 minutes, stirring every 20 seconds or so, until creamy. Stir in coffee beans till completely covered. Spread on a sheet of wax paper. Allow to cool on counter for 10-15 minutes, then place in freezer. Once completely hardened, break apart. 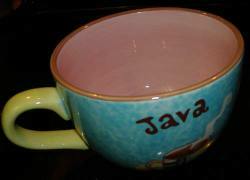 I've finally found the perfect morning latte cup. It's ginormous! Bigger than any of my other cups, almost a soup bowl. 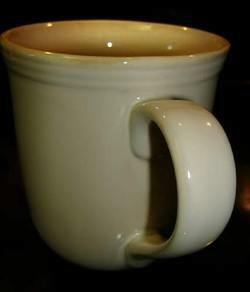 And this baby, unlike most cups of this size that have wide bottoms and correspondingly wide rims, has a nice, thin, no-dribble rim. 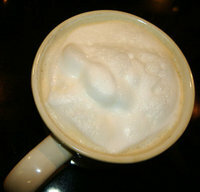 Sorry, no pretty latte art here, just fluffy foam. I'm gonna have to quit working, it's seriously cutting into my other endeavors. Now, if I could find a way to earn a living in Uru Live, that would be quite the apogee. Ah well. I have some coffees to review, especially for those of you who prefer fresh roasted coffee, but don't want to do the roasting yourself. 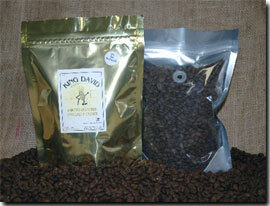 King David Coffee Roasters, a small coffee micro roasting company located in Nashua, New Hampshire, offer freshly roasted coffee, both retail and bulk/wholesale. You can select the darkness you prefer, and the grind, but of course, if you're going to bother to order freshly roasted coffee, you don't want it pre-ground. Sort of defeats the purpose. Additionally, King David's is "certified strictly kosher by KSA, Kosher Supervision of America". I hate to admit I don't really know what that means to coffee. Anyway, the three I've tried and can comment on are Costa Rica Tarrazu (light roast), Panama Boquete (medium roast), and Celebes Kalossi (dark roast). I started with the CR Tarrazu, since I have most experience with it. It didn't disappoint, it was fresh enough to suit me, and flavorful. I have to say though, I'm not really a fan of light roast coffee. The flavor is still a bit too green for me. I much prefer a medium roast, that still retains the regional flavors, but moving in taste toward the carmelized bean. Still, this light roast Tarrazu was good. I enjoyed the Panama Boquete, it was alright, but my favorite was the Celebes Kalossi, from the Sulawesi Island of Indonesia. I'm not that familiar with Indonesian coffees, and this was excellent in a dark roast. Very tasty. One thing I noticed is there didn't seem to be much difference in bean color between the light and medium roasts. Maybe this has to do with the type of coffee, I don't know. The coffee chart on Sweet Maria's website is what I've been using as a reference for my own roasting experiments, and to go by that, the King David Panama Boquete was actually closer to a light roast. I need to get some freshly roasted beans from other companies and make some comparisons, but I would definitely recommend King David's as a source for freshly roasted beans. There was this ad jingle, back in my youth. It went "My dog's better than your dog, my dog's better than yours, my dog's better 'cause he eats KenLRation, my dog's better than yours." If you never saw or heard this commercial, you just have to imagine it. If you have heard it, I'm sorry in advance, because now that song will be stuck in your head ALL day. And maybe the rest of the week. It's been in my head for two days now, and it WON'T go away. It all started with coffee. Waking up and realizing I didn't have enough freshly roasted coffee beans to last my morning. I only had enough to jump start my engine. Now, I could have just roasted some, but, well, right out of the roaster ... not so good. Better if they sit overnight and breathe a bit. So I inhaled that smidgy of coffee I was able to make, and then dashed off to the store and the coffee shop for a double shot. Ohmigod, I'm here to tell you - c'mon sing along with me now - my coffee's better than their's is, my coffee's better than theirs, my coffee's better 'cause mine is fresh roasted, my coffee's better than theirs!!! For a long time now I haven't made a big deal about this with my friends and family, because I was afraid they'd think I was turning into one of those [grimace] coffee snobs. You know the kind, the ones who sash-aaaay into Starbucks and rattle off their order at lightning speed, and then look down their noses at you when you can't figure out what the options are. I really don't want to become a [grimace] coffee snob. The bad thing about roasting your own - you can't settle for stale coffee, you're completely ruined. So, my next endeavor is to research coffee shops in my area that do roast their own. I'm sure there must be a few. Because the next time I run out of freshly roasted, I won't be going to THAT particular coffee shop again, unless it's to jingle them with "My coffee's better than yours is..." Heheh. I bought some white chocolate creme liqueur to try. Is it too early for a toddy? Can I sip my lunch? ... It became customary for a community’s young men to go “wassailing” on New Years Day. They visited the houses of their family, friends and the town’s elite, receiving at each abode a bit of meat and an alcoholic drink. The wealthy benefactors were obliged to share their bounty in order to win the loyalty of the lower class and preserve the social structure, so the young men sang and made merry, becoming more and more inebriated after each visit. The man who completed his holiday rounds was revered by his intoxicated peers. In this precursor to Christmas caroling, the drink most often served was the Tom and Jerry — a frothy potion made from egg, milk, brandy and spices. Except for holiday wassailing, the drink was confined to the upper class in England; poor London-folk could rarely afford milk. In America, however, farms and dairies were plentiful, and the drink gained popularity and a new name — eggnog. The word “noggin” was used in 1500s Europe to denote a small, carved wooden drinking vessel, and the word “grog,” often used in Australia, typically denoted a rum-and-water drink. “Egg and grog in a noggin” was a mouthful, and the name was shortened. Be that as it may, I wanted to share a couple of interesting recipes I found, variations on tradition, to be sure, but interesting none-the-less. 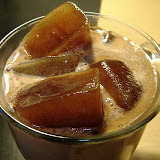 First is a modified recipe, originally posted on about.com's coffee/tea section, for coffee grog. I added chocolate, a splash of orange flavored vodka, and voila. Not for the faint of heart. Melt chocolate. Break fruit peels into 6 pieces, each. Place one piece of each into cups. Blend butter, sugar, cloves, nutmeg, chocolate and cinnamon in a small bowl. Mix coffee and cream together with the spice mixture. 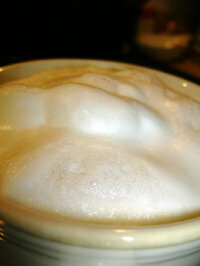 Serve into 6 cups with whipped topping if desired. Second, a recipe I haven't tried yet, but it's up next. Can't remember where the recipe came from. I'll let you know how it turns out. Combine milk and chocolate milk in a saucepan and scald (do not boil). In another bowl, beat eggs and sugar together until thick. Add about 1/2 cup of the hot milk to the egg mixture and mix through. Then stir the egg mixture back into the hot milk, and place over low heat. Add whipping cream and Kahlua. Cook and stir until mixture thickens. Do not boil. Remove from heat and add rum and cinnamon. Let cool and refrigerate until chilled. Serve with a sprinkling of grated chocolate and nutmeg. There, now you're all ready for Christmas wassailing with grog and nog. Merry merry! Don't forget to get your last minute Christmas recipes in to the Carnival!! This new product might just be for you. Bada-Beans, advertised as "The Coffee Confectioner", are little oval dissovable tablets that you add to your coffee for a little extra flavoring. They come in these little tins, which are handy for carrying in your purse, but which are disturbingly reminiscent of the tins for Altoids or other breath mints, which I could see might be a problem. I mean, you reach in for an Altoid while driving and you get a Bada-Bean by mistake. I'm not going to pop one in my mouth to try it. Get Mikey, he'll try anything. Bada-Beans come in three flavors: Crazy Carl's Caramel Fudge, McCoy's Dream Vanilla Bean (which I liked very much), and Hazel's Nutty Hazelnut. The Caramel Fudge was ok, but not up to my high expectations of chocolate flavorings. The Hazelnut was difficult because it didn't smell good, and I have a hard time making my mouth try something my nose doesn't like. I did try it though, and it tasted better than it smelled. I only used one tablet in my cuppa, and the flavor was pretty subtle. My brother needed two tablets to get enough flavor, and then he said he didn't like the aftertaste which may have been caused by the fact that the first ingredient is sorbitol, a common sugar substitute. I think they would have done better to leave the sorbitol out. But all in all, this is an interesting concept. Anybody else try these? I'm treating myself to a sweet cup this Sunday morning. The air is crisp here, although we never get the kind of winter cold that other parts of the country get. Still, it's cold enough to warrant a big fuzzy blanket, socks on my feet (for a change), and a cuppa hot minty mocha coffee. There are many ways to make your own Mint Mocha. If you're a creamer kind of person, you can find Coffee-Mate's Peppermint Mocha in stores now. I bought some to serve my Thanksgiving guests and it's pretty darn good. A little more mint than mocha, but that's ok. If you're not interested in a creamer-tainted cuppa, you could just add a drop or two of peppermint extract to your coffee, and maybe a squirt or two of chocolate syrup. But I happened to have on hand (left over from Chocolate Friday's brownie adventure) some Hershey's chocolate mint candy canes. I gotta say, these are some of the best candy canes EVER, but somebody was over-vigilant in the wrapping process. It's tough to get the cellophane off! I only managed to peel three before I got frustrated and stopped. But three was enough for my morning cuppa here. Break the candy canes into small pieces, put them in a sandwich bag, take a hammer and start smashing. I took it outside and hammered on the patio, as the hubs was still snoring, and I double bagged the candy canes, since I was going to really pulverize these. The dogs watched me closely through this whole process with quizzical expressions. I wish I'd had the camera handy; it was really funny to see them looking at me, at the baggie, at the hammer, back to me, cocking their heads. What were they thinking, I wonder? Heh. "Mom has finally lost it, but something in that baggie sure smells good!" Once I had candy cane powder, I added it to a bowl with a few spoonfuls (spoonsful?) of cocoa. 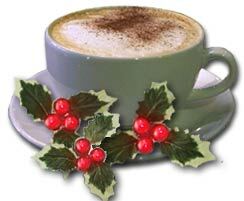 Stir into hot coffee and enjoy! This is definitely something I'll be serving for our Christmas brunch. I'm going for a second cuppa! !